Typically, anywhere from 20 to 40+ Nittany Lion fans per game. Our growing group includes fans of all ages, joining us as singles, couples, groups of friends, and families with kids. Drawings for Penn State goodies and prizes. Everyone who shows up gets at least 1 raffle ticket. Prizes include all kinds of stuff: hats, shirts, mugs, license plate holders, bobble heads, PEZ dispensers – you name it. Every once in a while, we even have things like sticky buns and Creamery ice cream. If it has something about Penn State on it and we can find it – we raffle it off! Collections for our local PSU scholarship fund. We pass the can every week and collect money for the scholarship fund. Good fun in the company of other good-spirited Penn State fans. Our events are always open to all Nittany Lion fans – please join us and remember to wear your Penn State gear! You do not have to be a member of our local alumni association chapter to attend – but we might have membership forms on hand for you to use if you’d like! Keep up with what’s going on and look us up on Facebook at Penn State Central Ohio Alumni Association, or here on our website www.psucolumbus.org! Are you a LinkedIn member? Position yourself for local professional networking with other area alumni. 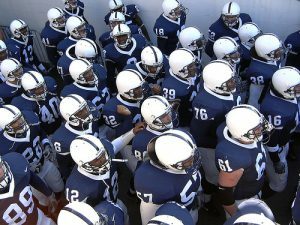 Join our new LinkedIn group, the Penn State Alumni Association – Central Ohio Chapter.